Without fail, the same thing happens every time Don Lamkin cruises Downey Avenue towards 2nd Street. With its bright colors, cartoonish design, and larger-than-life icons, Downey Doodle-icious has become its own attraction. People walk to Porto’s, but Downey Doodle-icious stops them in their tracks. Students study the mural. Teens take selfies in front of it. Politicians use the mural as portrait backdrops. It’s a textbook example of art bringing a community together. 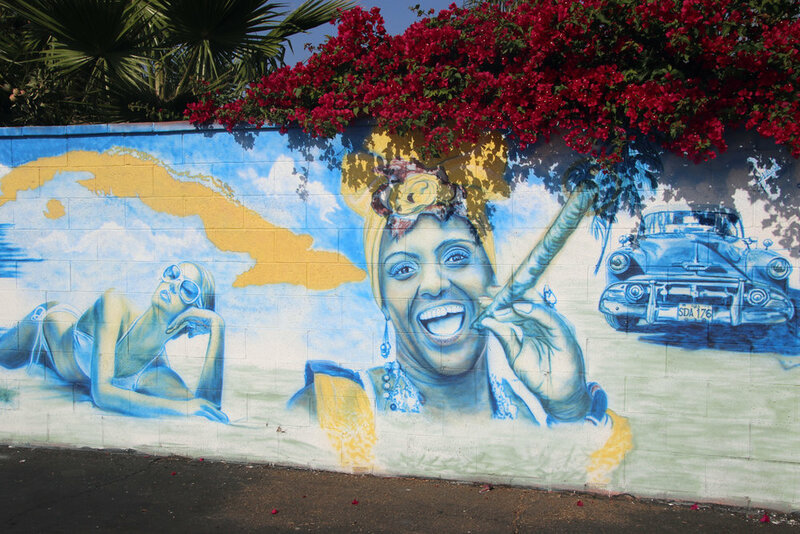 Downey’s Art in Public Places policy has resulted in a scattering of sculptures and murals throughout the city, some more accessible than others. There are also art pieces commissioned by private property owners, and some probably installed under the cover of darkness. 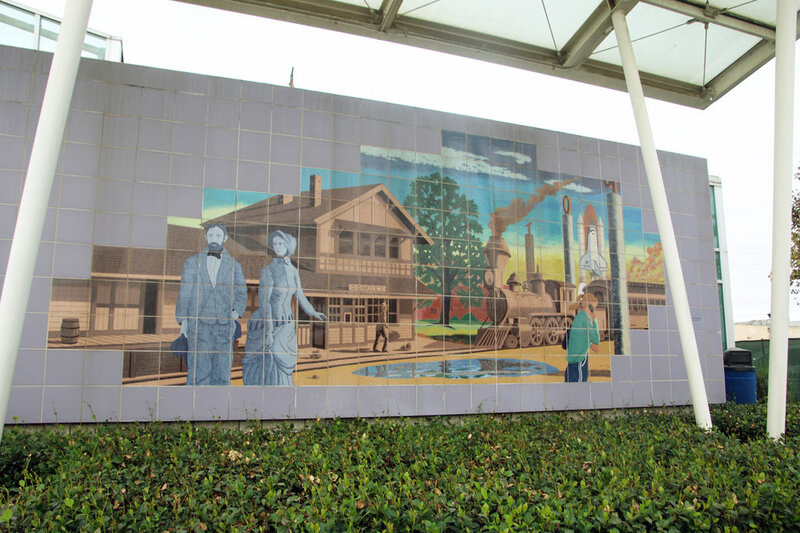 Below is a look at some of Downey’s public art. If I missed something, please let me know at eric@thedowneypatriot.com. Installed in 2014, Downey Doodle-icious has already become an iconic part of downtown Downey. Don Lamkin originally created Downey Doodle-icious as a raffle prize to benefit the Downey Museum of Art. He created 10 prints, and all sold within 3 hours at the Downey Street Faire. Lamkin was later asked by the City Council to paint Downey Doodle-icious on the side of the Porto’s Bakery parking structure. Lamkin agreed, with help from Hector Beltran, Jorge del Toro and Liz Moran. Lamkin doesn’t currently have plans for any more public art in Downey, but there’s one project he would be excited to complete. The sculpture was created by Jameel Haiat, a designer at Walt Disney. As far as I can tell, this mural doesn’t have a title. It was installed in 2001 and created by artist Terry Schoonhoven, whose work also appears at Union Station. It’s located at the Downey Depot, near Firestone and La Reina. This painting isn’t particularly complicated or exotic, but it’s fun and received a ton of attention at Dona’s Donuts’ height of popularity earlier this year. The backdrop is still a popular image on Instagram. 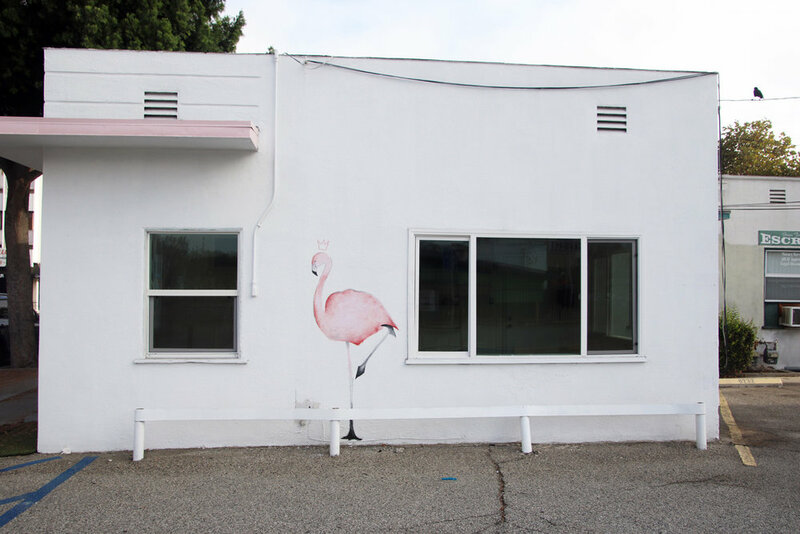 This nearly 6-ft. tall pink flamingo showed up after Sandoval Bail Bonds closed up shop earlier this year. The building is now vacant and being prepared for a new tenant. After doing some digging, this appears to be the work of Hector Ponce. He’s been called “the Warhol of the walls” for his street art in Los Angeles. Located on the side of boutique fashion store Gypsy Queen, this painting was done by painter and tattoo artist Alfonso Garcia. He owns a private studio in Los Angeles. The uniform doesn’t have a number, so I can’t say definitively that it’s LeBron. But yeah, it’s LeBron. This 280-ft. painting was done by Long Beach artist JC Ro, who has completed similar projects throughout Los Angeles. It’s isolated and can be difficult to find, but this mural was created by LOVE Crew. It’s located on the side of Research Vintage, a consignment store near Big 5. It’s quite the juxtaposition, a piece of abstract art outside a smog check facility. Titled “Descending Sphere,” this sculpture was installed in 2008 by artist Jon Seeman, whose work can be found around the world, including in Dallas, Las Vegas and Tokyo. 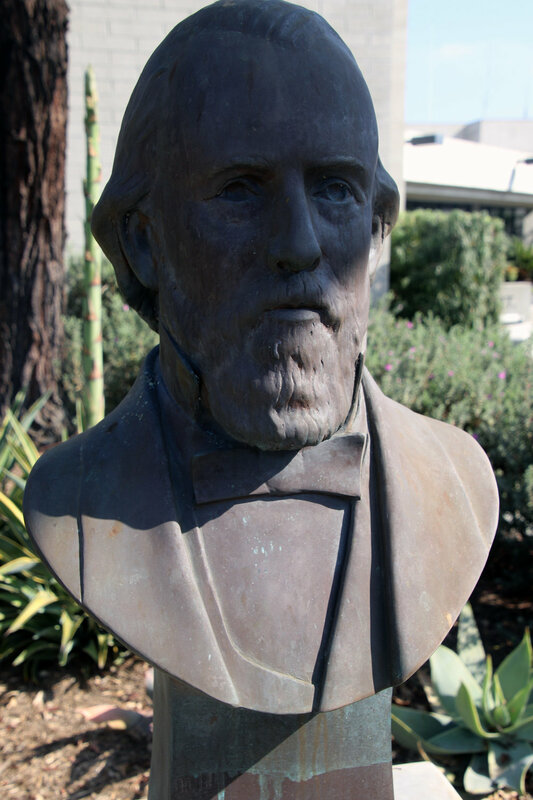 This bust of John Gately Downey was created by Irish sculptor Mark Rode and installed in 2010. An identical sculpture exists and it’s located in Roscommon County, Ireland, Downey’s birthplace. I hesitated to include this as “art,” but I think it depicts beauty in its own unique way. 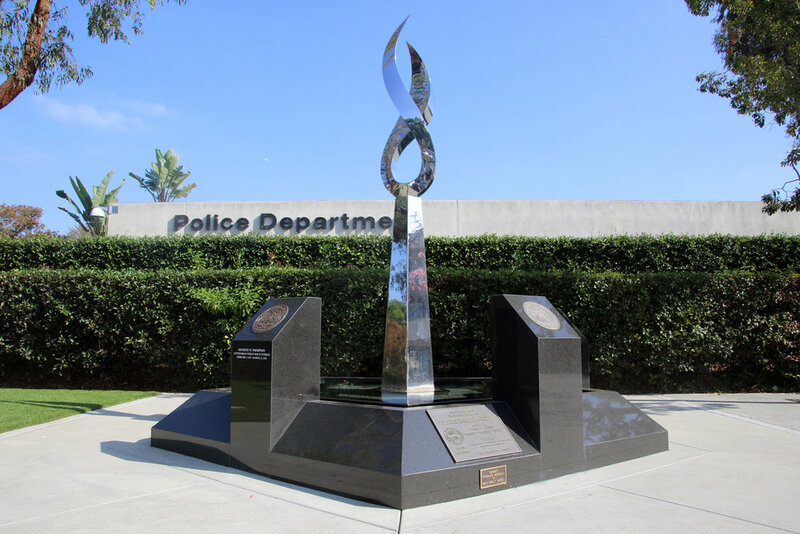 The statue pays memory to the two Downey police officers who died in the line of duty. Most striking is that the monument includes space for future names. This art piece was installed in 2012 in honor of Downey’s military veterans. The sculpture was created by James T. Russell and is modeled after the veterans monument in Cerritos. The artist known as Bumblebee has been known to create illicit art pieces under the cover of darkness. While this painting was also done at night, it was created with the full permission of the property owner, so it still stands today. This 20-ft. artwork is located on the side of the Coba Cabana Hair Salon, just around the corner from Downey Doodle-icious.